When I read the text message, I lazily said “no” and didn’t research any further. I continued my work, clicking one window then another. But an hour later, I realized what it meant. It meant: danger, life, death, destruction, chemicals, loss. And in my own self-centered way, I worried about my apartment. My things. My macbook pro. My lovely bed. I thought about the curry that I made last night. Then the electricity that supplied power to all my things. Then the books that I wrote in. And then my roommate who is slightly a gimp at the moment. That’s what I thought of and I zoomed back home, nearly jogging up the steps in my black bootie heels, tapping. In the distance, I saw the fire trucks on Mission Street. A smoldering mess with smoke still spiraling in the sky. I was relieved. It was on Mission Street, blocks away from my building. Just the other day, I mentioned to a friend that my building was rather close to another building. It may go up in smoke. Then a few days later, the earthquake happened. Inside my room, I found solace in my mess and wondered that my papers—the receipts, the books, the documentation all over my room—would that go up in flames? I looked through the windows at the back of the apartment wondering if I could see the smoke. Nothing. Fortunately, more than 3 hours had passed since the fire started where it was first defined as a 2-alarm fire, then upgraded to a 5-alarm fire. Later, I walked pass the scene. It was now past 7 PM, more than 6 hours since the fire was first reported around 1 PM. Smoke still billowed out from the destroyed building. I remember the building, often dismissing it. A discount shop that sold plastic things that I didn’t need. Big plastic backpacks and suitcases. Things that hung in air balloons. Things that were cheap. Things that I would have bought in my early twenties due to my mindset in budget, but now, I would prefer quality and durability. I walked past it ever since I moved to the neighborhood since fall 2006, never noticing, never paying attention, just wondering how many more steps did I need to get to where I wanted to go. Nearby businesses were all closed. My favorite produce market was shuttered, losing dollars to the missing hours. I loved going there to buy cilantro, tomatoes, and onion. The butcher shut as well. The walgreens was dark. But in the distance, I saw the barbershop and a woman selling white flowers. There was an Internet Cafe that was damaged. 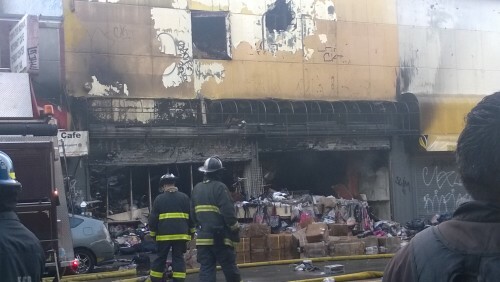 A nearby discount store also damaged. The roof seemed to have caved in, spilling its contents of plastic wares, toys, and so many useless things. As I stood there, gawking with the other bystanders, the smoke tickled my throat. They pulled out their smartphones, capturing the scene. That’s what we remember and then…should we remember? I remembered the risky moment I took in Taksim Square last year during the Gezi Park protests, and the way that the tear gas made my eyes water. No, not this time, fire. You won’t get me this time. On the way back to my apartment, I walked around a fabric cloth embroidered “San Francisco”. It was dry despite all the water filtering through the streets from the fire trucks. Will anybody pick it up or will it be swept away? Then I went home and shopped for renters’ insurance.